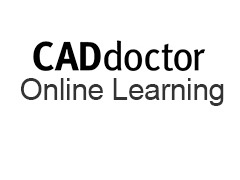 Online Tutorials for CADdoctor, featuring CADdoctor Gap-Filling, Solid Envelope Creation and Mid-Surface Generation. CADdoctor is the ultimate desktop application for 3D data translation among multiple CAD formats, PDQ validation, repair and transformation. It also simplifies the geometry, reduces the data size and generates mid-surfaces for efficient and accurate CAE analysis.